Out of concern for the safety of residents, homes, and our wildland areas, all fireworks are illegal anywhere in Escondido. That means that, other than at professional shows put on by licensed pyrotechnicians, no fireworks can be possessed, stored or discharged in the city of Escondido at any time during the year. 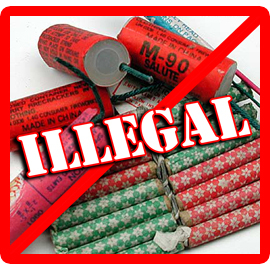 Prohibited fireworks include sparklers, poppers, snappers, fountains, bottle rockets, and any other explosive devices. If you live in Escondido, have fireworks in your possession, and wish to dispose of them, contact the Escondido Fire Department at 760-839-5400 to make arrangements. If you are aware of anyone selling, providing, or discharging any of the above devices, please contact the Escondido Fire Department immediately at 760-839-5400. The following ordinances are part of the Escondido Municipal Code, Chapter 17 OFFENSES--MISCELLANEOUS PROVISIONS, ARTICLE 4. WEAPONS AND EXPLOSIVES. Professionals who will put on a Fireworks show are required to complete an Application for Permit. Please see the Current Fee Schedule.